A blond, blue-eyed boy smiles at you. 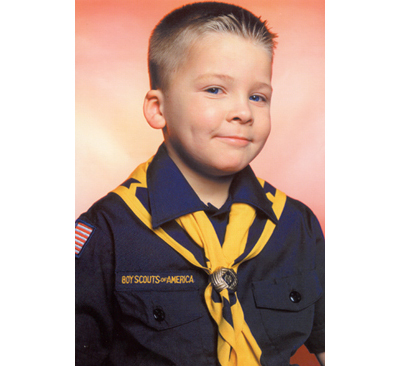 Aged about 9, his chubby dimpled cheeks and neat boy-scout uniform represent all that is wholesome, innocent and good in American society. In another image a man of about 60 stands proud, gazing out in to the distance wearing nothing but a flag bandanna around his neck. Bathed in a golden halo he appears as an American sage. Gimpel Fils is pleased to announce America, a new series of work by Andres Serrano. America is a series of portraits representing the different faces of the USA. America evolved from Serrano's reaction to the terrorist attacks on New York and Washington DC last year, and his questioning of who is an American and what his country stands for. The series is driven by the idea that America is a community of communities from a large and varied geographical and cultural map but who are united by a common bond and a continuing belief in the American dream. The Unites States of America prides itself on being a melting pot: A place where everyone, regardless of colour or religion is able to belong and prosper. By creating such a large series, Serrano has been able to capture this diversity. Regardless of their age or status Serrano has given each of his sitters the same space and the same respect. For Serrano, this emphasis on the egalitarian nature of American society is something to be celebrated. In America each life is significant, each individual as important as the next. Of course some people stand out immediately. But while Serrano presents the larger than life characters, he has also captured the quiet people, the people who are important to our everyday lives but who are so often overlooked. Compare Beverly Pabon the postal worker in her dowdy blue collar uniform with the glitzy glamour of Jennifer Ridgley the Rodeo Queen, and one is struck by the subtlety and underplayed beauty and dignity that Serrano has captured in his shy sitter. In perceiving these small nuances Andres Serrano has produced a body of work that manages to place each person within the wider American community without losing sight of the individual. Since Andres Serrano's Piss Christ caused outrage amongst the fundamentalist Catholic right and the US Senate in 1988, he has been branded controversial, exploitative and disgusting. However, the scandal fuelled by Senator D'Amato's opinion that Serrano's art not only dishonoured God, but the American people, has become hackneyed and irrelevant in the light of this new work. America proves what many people already know: Andres Serrano's continuing preoccupation with colour, form and composition in combination with a willingness to tackle the big issues at work in contemporary society makes him one of the most thought provoking and interesting artists working today.